The NL East is a mess. The Nationals are in pole position with one of the best rosters in baseball. You'll also find the Phillies and Braves stalled out. Both clubs will struggle to win 70 games. Regularly competing against the two worst teams could give the Marlins a chance to grab a cheap Wild Card berth. 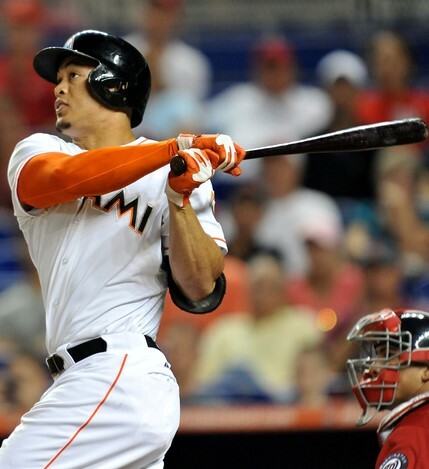 The talent distribution remains top heavy, with Giancarlo Stanton leading the way. However, Miami has done well to add considerable depth to the roster. Marlins Stadium is a nightmare for offense. Once we adjust for park effects, this should be a decent lineup. The rotation looks like a bright spot with eight to 10 viable major league starters. When he's healthy, Fernandez is a monster. His repertoire consists of a 96 mph fastball, 80-grade curve -- on the 20-to-80 scouting scale -- and decent changeup. Recovery from Tommy John surgery usually runs 12 to 15 months for the first procedure, so Fernandez is about two to three months away from returning. Expect about 120 innings. The good news with TJS is that most pitchers return to their previous talent level. If you have a place to stash him, he's a great fantasy reinforcement. Latos is unusual from a fantasy perspective. On the one hand, he's moving from one of the best hitters parks to a top three pitchers park. That alone should boost his value. However, his velocity plunged two mph last season. His strikeout rate fell to 6.51 K/9, which limits his fantasy ceiling. If his fastball doesn't rebound, he'll have trouble accessing his plus secondary stuff. Despite throwing a lot of sinkers and splitters, Latos was a fly ball pitcher last season. That's not a problem in his new home park, but it does indicate that he may want to alter his approach. Rather than using a mediocre sinker so frequently, he could embrace his best stuff by working high in the strike zone. It worked for Collin McHugh. Alvarez threw seven distinct pitches last season, although only four of them are part of his regular repertoire. Command of his 94 mph fastball, sinker, plus-plus changeup, and slider allow him to post good numbers. Unfortunately, fantasy owners can't get much out of his 5.34 K/9. He's a better asset for H2H owners where his strikeout rate can be overlooked. While Fernandez recovers, there are spots available for both Tom Koehler and Jarred Cosart. If the rotation is still full strength when JoFe returns, one of those worthy arms will be pushed aside. They're both adequate stream starters, especially at home against the Phillies or Braves. Other names to watch include David Phelps, Andre Rienzo, and Justin Nicolino. They're all viable streaming options once they receive an opportunity. A major league rotation usually needs 10 pitchers, so expect to see everybody at some point. The Marlins closer has been consistent and reliable over the last four seasons. There are a few cracks in the foundation, and he's getting expensive for a notoriously cheap Marlins franchise. His velocity declined slightly last year. His 3.17 ERA was the worst of his career. On the plus side, he managed 11.57 K/9 and only 2.89 BB/9. It's hard to say with certainty where he found the extra strikeouts. His whiff rates have remained stable year-to-year, which leaves luck and sequencing as the likely culprits. He switches from a sinker to a four seam fastball when ahead in the count, which likely helps. The sinker allows more contact. His four seam rate did increase compared to 2013. I'm tentatively willing to suggest the strikeouts are a result of sequencing. It's possible he can replicate a similar rate this season. After Cishek is Bryan Morris. He's kind of like a right-handed, poor man's Zach Britton. Down on the farm lurks Carter Capps. His pitch peripherals read like a combination of Craig Kimbrel and Ken Giles. He had a rough spring, so he's working out the kinks in the minors. The Marlins lineup should be a modest strength so long as Stanton remains healthy. He's a top five pick, and he's worth the investment. Expect his batting average to drop into the .270s. The power and run production should remain elite. He even showed a willingness to steal a few bases. It's the supporting cast that matters for Stanton, and it's a good one. Christian Yelich is one of the top young talents in baseball. He makes loud contact, but he doesn't lift many balls in the air. Despite better than average power, he had only nine home runs last year. It's a tradeoff. Yelich could add a little more loop to his swing and swat 20 home runs a year. However, his current approach supports a high BABIP, which allows his average and on base percentage to play up. He was the leadoff hitter last year, but Dee Gordon is expected to fill that role. If Yelich is hitting second or third, he should put a little more effort into power. I'd also like to see more aggression from Yelich. He's extremely disciplined at the plate, especially on pitches outside the strike zone (swing rate nine percentage points below league average). His 20 percent strikeout rate is very high considering his contact skills. He could be much more valuable to fantasy owners if he emulated Michael Brantley's approach. His current ADP of 78 is reasonable, but it doesn't offer much room for profit. I'm skeptical about Gordon. He's the third second baseman off the board in NFBC with pick number 44. Other sites have him going in the 60's which is more reasonable. His on base skills are somewhere between average and execrable. He broke out last season with a .289/.326/.378 line. The high stolen base total is an obvious plus, but the downside includes an OBP that hovers around .300. He'll quickly find himself hitting in front of Adeiny Hechavarria if that happens. He makes enough contact that he could continue to shave his strikeout rate. If you're looking for a nice, late-round value pick, try Martin Prado. The Fish acquired him from the Yankees this offseason. He's available after the 200th pick. His fantasy value stems from versatility and adequate production. He'll probably bat second on occasion, which should help his run totals. He'll also pop 10 home runs with a good batting average. It's not the sexiest profile, but it's useful late in the draft. Other hitters of note include Marcell Ozuna and Michael Morse. Their ADPs of 130 and 257 are reasonable. The Marlins are the 15th team in our power rankings. They're looking to take advantage of a weak NL East division as a spring board to the Wild Card. The team is heavily reliant on Stanton, although the supporting cast has improved over the years. The entire roster offers solid, young depth, which should help the club survive the rigors of a 162 game season. There are few potential fantasy bargains in Miami, but most of the team is reasonably priced. While it's important to note the pitcher friendly home stadium, don't overdo the adjustment.